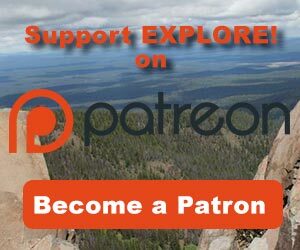 Vidae Falls – Crater Lake National Park - Explore! Vidae Falls – Crater Lake National Park - Explore! Vidae Falls . 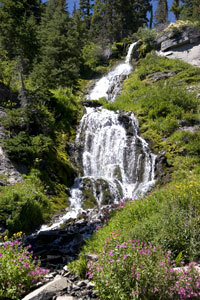 . .
Vidae Falls is the best known and most viewed waterfall at Crater Lake National Park. It’s 100 foot drop is quite spectacular and it’s easy to find; just above the East Rim Drive about 3 miles east of Park Headquarters. A large turn-out is provided. Some folks glance at the falls as they drive by; some stop and shoot a photo from the car; many get out to take a picture and a few walk part way up the falls. Very few ask questions, the most common of which seems to be “where do the falls come from.” The official answer is in the park newspaper: the creek is spring fed. We had more questions about the waterfall and Vidae Creek that creates it. What does the creek look like above the falls? What happens to it below the falls (it seems to disappear at Rim Drive)? How does a spring arise so high on the mountain – does Crater Lake leak? Well, I suppose we could have asked, but we are explorers, so we explored. We read of a trail to the top of the falls, but it’s not mapped and we didn’t know exactly where to look for it, so we pulled out our National Geographic Map of Crater Lake and found that the ridge over which the creek falls is at about 6,750 feet. Since the Rim Drive is going up hill, we just walked up the road until we found an easy spot to climb the ridge. We could have gone a little farther to the 6,750 foot level on the road, but about 0.4 mile was sufficient for an easy climb. We then followed the ridge to the falls. It looks like the trail we heard about climbs the ridge to the west of the falls, but it doesn’t look like it has been maintained. From the falls, we walked up the creek to its source, not much more an 0.1 mile above the falls. The creek starts slowly as it moves through the fir forest, until it begins a series of rapids and small falls in preparation for its big leap. The source of Vidae Creek is obviously a spring. It emits several streams from a pumice bank. The streams quickly merge to form Vidae Creek. So where does this spring come from? We know Crater Lake leaks a bit. Studies show that to keep the lake level constant, plus or minus 16 feet and given recorded snowfall and evaporation, about 17 billion gallons of water seep out each year. Nonetheless, it would not be leaking here – the spring is 600 feet higher than lake level. We walked up the bank above the spring and the answer became obvious. 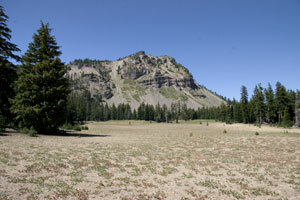 At the top of the rise is a large pumice flat with trees around it and a few through the middle. Above this area is Vidae Ridge, a huge, steep ridge that overlooks the lake at Applegate Peak (8,126 feet) and towers 1,200 feet above the pumice flat. Cliffs along Vidae Ridge face east, toward the pumice flat. These cliffs obviously catch a lot of snow and that snow is avalanched and melted onto the pumice flat below. The flat itself collects a goodly portion of the park’s average annual snowfall of 44 feet. That’s a lot of water that has to go somewhere. With the cliff to the west and a rock ridge to the east, the ridge that creates Vidae Falls, this mass of pumice is well contained and acts like a sponge, collecting water and gradually leaking it out at springs on its periphery. 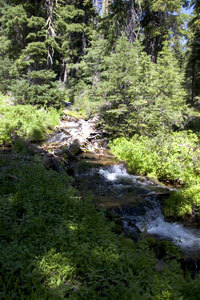 The spring at Vidae Creek is the largest we saw, but there are several smaller springs and seeps just above Rim Drive. The contrast of these green springs and their surrounding wildflowers with what amounts to a pumice desert, is striking. By the looks of it, the heads of these springs are higher earlier in the year, when there is more water in the sponge, as we would expect. With the mystery of the Vidae Creek’s source resolved to our satisfaction, we moved on to our other questions. The waterfall seems to disappear at Rim Drive. Most visitors don’t seem to wonder about this, but we did. As it turns out, the water is collected in a ditch above Rim Drive and directed to a pipe that goes under the road to a point just uphill from the Vidae Creek picnic area. The pipe is well hidden, but our diligent search found it disguised under a grove of small trees above the trail to Crater Peak. The Creek flows to Sun Creek through a series of rapids and tiny waterfalls just to the east of the picnic area. 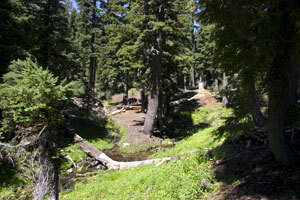 It’s a lovely creek with wildflowers where sufficient sun penetrates the forest canopy. If you want to walk along the creek, you might want to follow its west side, since the east side is dotted with springs that make walking difficult. Just up and down Sun Creek, from the point where Vidae Creek joins it, are more great waterfalls. Could not use HTML 5 or Flash for playback. You can download the file as MPEG4/H.264 or Ogg Theora file. This adventure rates highly in the category of scenery because of the waterfall itself and the expansive views of Vidae Ridge. The sense of adventure is there as well. The trek above the falls and below the falls gets off the trails and a little into the backcountry, but not very far into it. There was no one else exploring these places – besides right at the waterfall and in the picnic area. The variety in the experience is good too. The combination of rock and water within the ecosystems and the contrast between pumice desert and lush springs only adds to the variety. History rates low. There is the history of Crater Lake National Park all around, but nothing is interpreted for the explorer. The journey offers some interest to kids that will enjoy messing around at the falls. Overall, I gave this adventure a rating of 5.4. All photography, text, videography and post production by Explore! Pathfinder, Jerry Haugen. ©2010 Global Creations LLC, all rights reserved. Great post! I just shared it on my facebook page. 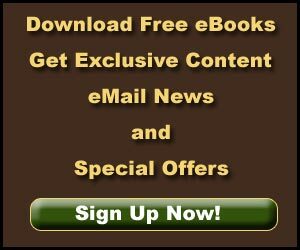 Thanks for posting the link. Great job highlighting some outstanding photos and photographers with your Facebook page!